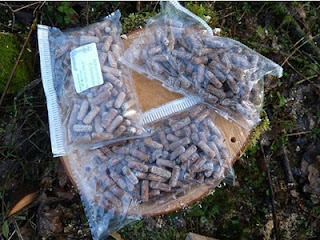 Our previous attempts at inoculating logs and stumps with the mycelia of edible mushrooms have met with varied success. I thoroughly recommend Paul Stamets Mycelium Running: How Mushrooms Can Help Save the World. He suggests a multi-pronged attack on the wood: even the (vegetable oil based) lubricating oil for his chainsaw is inoculated with spores. From experience and from reading, I’ve also come to realise how important it is not to let the log or stump dry out. 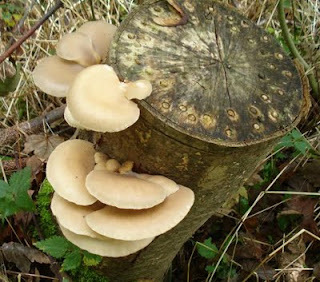 Oyster mushrooms are saprophytic, that is they are decomposers. (The other basic categories are parasitic, mycorrhizal and endophytic). We’ve had most of our success with this one and decided to try again and use a different supplier to get another point of view. Ann, of Ann Miller’s Speciality Mushrooms, supplies the inoculated dowels that we’re used to. (Mushroom spawn is also available in an amorphous mass of bran and sawdust but that requires a special tool to insert the plug into the hole in the log). Included in her kits are flakes of wax with applicators; the wax seals the plug off from other airborne spores, to give our chosen mycelium the best opportunity to get established first. She also suggested some variations on the technique we’ve been using to date. 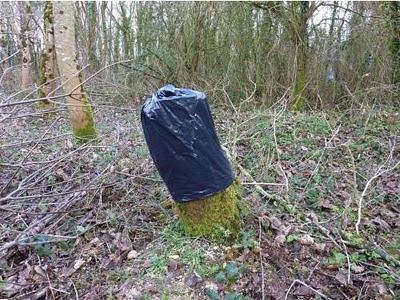 The stump gets covered with a black plastic bag, to help preserve humidity and then covered with brash to keep the sun off. 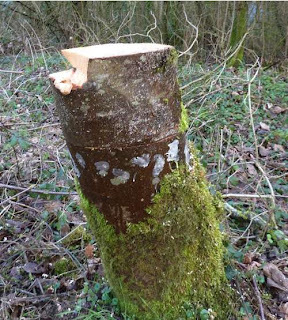 When our chainsaw-wielding volunteers, Paul and Liam, thinned a patch of sycamores for next winter’s firewood, I asked them to leave the stumps standing to a comfortable working height of a couple of feet (60 cm). I also asked them to cut again, below their felling cut, to leave a flat surface in which to drill a ring of holes for the dowels and provide a cap to cover, and so keep moist, the inoculated face. The two main problems I think we’ve had is using wood that was already infected with another mushroom (fortunately another edible mushroom!) and letting the stumps dry out. Ann says that watering stumps or logs with a watering can doesn’t wet the log, which need to be immersed in water for a while, impossible with a stump, meaning that we should spend more effort not letting them dry off in the first place. Just two weeks later, I had a peer under the brash, under the plastic bag and under the wooden cap, to see that the mycelium is already running. We’ll keep and eye on them over the next few months and, if they look ready to flush, we’ll remove the plastic bags as it turns cooler and damper in autumn. 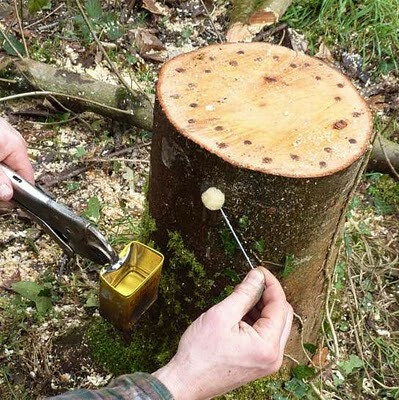 Permaculture-wise, we don’t need to do anything to kill the stumps, which would otherwise coppice and, after the initial effort and expense, we can leave the mycelia to work unassisted, eating the stumps and turning it back into soil, while intermittently throwing out edible mushrooms for up to five years. 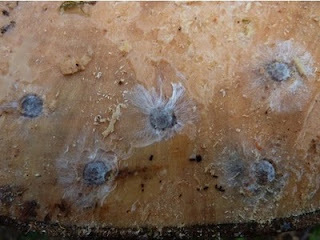 photos show the dowels as they arrive from Ann; me applying wax; an inoculated stump; protected by a bag, the mycelium starting to run and one I prepared earlier, fruiting! Looks great! Thank you for showing the detail of the process in the photos. I look forward to doing this in the future. Soap is so easy. So long as you can source caustic soda (lye) (an ingredient in drain cleaner) also known as sodium hydroxide. No fancy equipment needed. The cheapest olive oil (pomace) is the best. Check out lots of soap-maker's blogs. a very comprehensive site. you can order a very good book from them..
You can input a recipe and it will calculate sodium hydroxide needed, and can do it in grams or ounces. Yes, bite the bullet. You'll love it. Post pics please. Wow, this is so cool! I'm surprised the stumps dry out in moist, rainy Brittany. How do the mushrooms taste? Thanks, Ryan, Kate and Sparklee for your comments, they're always appreciated. Sparklee, I've tried to leave a comment twice on your blog about the fish without success! Thanks for sharing the tips about the plastic bags. I'm growing some logs in a garage right now in the city which are due to fruit around May if all is well. I wish I knew about the plastic bags before. However, we do have a small wooded lot elsewhere with stumps. I'm going to give your idea a try in the spring. I am still trying to like eating mushrooms. 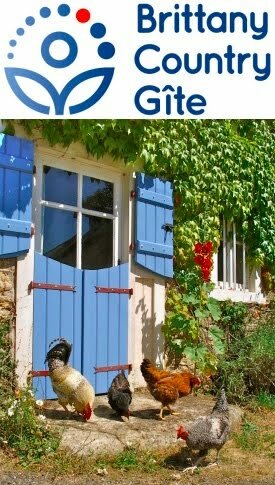 Stuart, when I come to france you may have to have a go at convincing me that they are nice! Thank you Linda and Christina for your comments. Yes, Linda, we wish we'd know about the plastic bags before but that's how one learns! Christina, you need to get Jane Grigson's book The Mushroom Feast compete with more than 250 mushroom recipes, one of those at lest must appeal!